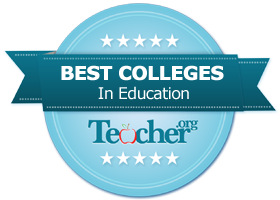 Early Childhood Education Program Ranked 2nd Best Program in the U.S.
Ranked 2nd out of 425 colleges in the country by Teachers.org. If you are seeking a change into a profession that better utilizes your energy or artistic talent, we invite you to join our Department of Early Childhood Education/Art Education. You might felt hampered or unfulfilled in an office, or you may have teaching experience and want to change your specialty. Our graduate programs in the Department of Early Childhood Education/Art Education will give you the skills and knowledge you need to become a certified teacher in New York State focusing on early childhood or art education (PK-12). Early childhood spans from birth to age eight, and teachers will be trained to deal with the unique needs of this age group. Art education teachers will learn how best to nurture the creativity of students of all ages and how to run a classroom where the imagination runs free but the students are under control. The Graduate Record Examination (GRE) General Test is required for a number of our graduate programs. Full details are listed on the Admission Requirements for Brooklyn College Graduate Programs page. Note that entering graduate students in fall 2016 are exempt from the GRE requirement if they enroll in Summer I courses.